Synopsis: Another shipment just arrived at our loading dock, the new RED and BLACK coloured Breville Barista Express Limited Edition. The Breville Barista Express Espresso Machine is one of our best selling espresso makers. 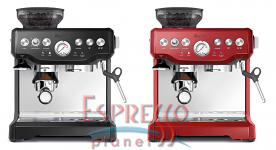 Due to huge demand, we are bringing in the Breville in red and black colours. This is a limited edition and won't be available for long. Once they are gone, they are gone.